The ISL at CMBN has pioneered the analysis of developmental power-band and oscillation data in infants from 4 months through 4 years. This involves examining brain oscillations within the child’s dERP. This area of study represents an emerging field and the ISL at CMBN has been at the forefront in this regard. The aim is to attain a better understanding how brain cells within and across brain areas are talking to and cooperating with each other in the course of early brain maturation and further to assist in early identification and treatment of divergent patterns in groups at high risk for developmental language disorders. We were the first to look at "resting" gamma power in frontal cortex in 16, 24 and 36-month-old children [e.g., 1], finding that those with higher language and cognitive abilities had correspondingly higher gamma power than those with poorer language and cognitive scores and that gamma power across this age period strongly predicts to language and cognitive skills through 5 years of age [e.g., 2]. Another important line of research examines the course of linguistic perceptual narrowing across infancy. We track developmental changes in brain dynamics, oscillations and acoustic mapping as infants acquire native language. Our results demonstrate that infants become more automatized and efficient in processing their native language as they approach 12-months-of-age and this occurs via the interplay between theta and gamma oscillations [e.g., 3]. It seems to be the case that theta oscillations support syllable processing, whereas gamma oscillations underlie the process of phonemic perceptual narrowing. Most recently we have focused on the dynamics of early brain plasticity and the role of attention and sensory recruitment in the construction of cortical sensory maps in human infants. Fine-grained analysis of infant brain waves (using dEEG) as they process critical timing cues provides information regarding how and in which parts of the brain this critical auditory mapping is occurring. Benasich, A.A., Gou, Z., Choudhury, N. & Harris, K. D. (2008). Early Cognitive and Language Skills are Linked to Resting Frontal Gamma Power Across the First Three Years. Behavioral Brain Research, 95, (2), 215-22. Ortiz-Mantilla, S., Hämäläinen, J.A., Realpe-Bonilla, T., & Benasich A.A. (2016). 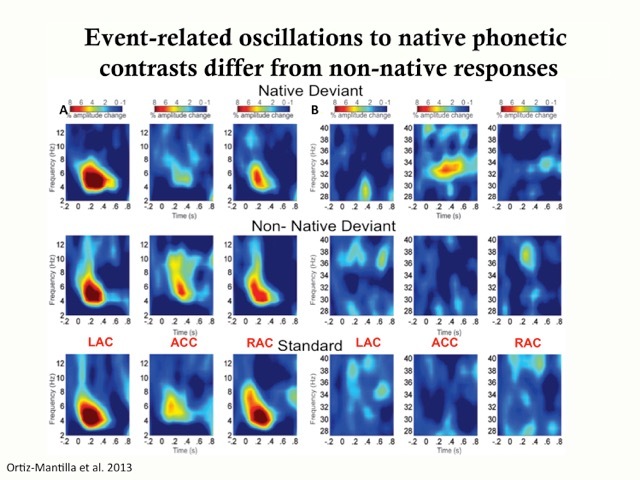 Oscillatory dynamics underlying perceptual narrowing of native phoneme mapping from 6 to 12 months of age. Journal of Neuroscience, 36(48), 12095-12105.